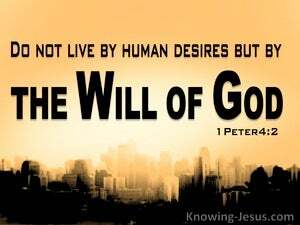 ﻿ 1 Peter 4:2 so as to live the rest of the time in the flesh no longer for the lusts of men, but for the will of God. in order to live the remaining time in the flesh, no longer for human desires, but for God's will. so that he can live the rest of his mortal life guided, not by human desires, but by the will of God. in order to live the remaining time in flesh, no longer by lusts of men, but by the will of God. So that he can no longer spend the rest of his natural life living by [his] human appetites and desires, but [he lives] for what God wills. So then, you should no longer live the rest of your lives [to satisfy] the sinful desires of your body, but to do what God wants. so that he no longer lives the rest of his time in the flesh, according to the desires of men, but according to the will of God. So that you may give the rest of your lives in the flesh, not to the desires of men, but to the purpose of God. so as to live the rest of the time in the flesh no longer for human lusts, but for the will of God. so that for the future he does not pass the rest of this life in gratifying his sensual passions, but in conformity to the divine precepts. so that he no longer lives his remaining time in the flesh, to the lusts of men, but to the will of God. that he may no longer live the remaining time in carnality according to the lusts of men, but in the will of God. and no longer lives by what men desire, but for the rest of his earthly life by what God wills. (for he that hath suffered in the flesh hath ceased from sin) That ye may no longer live the rest of your time in the flesh, to the desire of men, but to the will of God. so that now the time that remains in the flesh, he might live, not unto the lusts of men, but unto the will of God. That no more to the eager desires of men, but to the will of God, should he live the remaining time in the flesh. 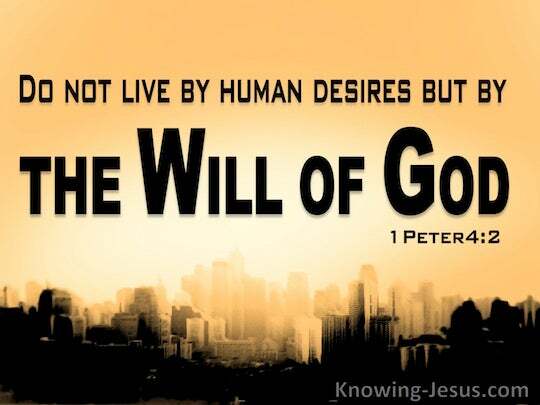 in order to live the remaining time in the flesh no longer for human desires, but for the will of God. 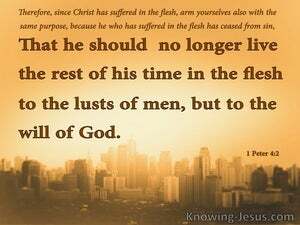 in order no longer to live in the lusts of men, but in the will of God the remaining time in the flesh. that he henceforward should live as much time as remaineth in the flesh, not after the lusts of men: but after the will of God. nerve you to spend the rest of your time in the flesh for the will of God and no longer for human passions. so that in future you may not spend your life in the flesh according to men's desires, but in the will of God. in that he spends the rest of his time on earth concerned about the will of God and not human desires. that ye may no longer live the remaining time in the flesh after the lusts of men, but after the will of God. that you may no longer live the rest of your time in the flesh according to the desires of men, but according to the will of God. To the end that, no longer, in men's covetings, but in God's will, ye may live, the still remaining time. that he might not spend the remaining space of life in the flesh after human passions, but the divine will. and so will live the rest of his earthly life guided, not by human passions, but by the will of God. that in future you may spend the rest of your earthly lives, governed not by human passions, but by the will of God. so that he no longer can spend the rest of his earthly life in harmony with human desires but in accordance with God's will. that ye no longer live the rest of your time in the flesh to the desires of men, but to the will of God. that he should no longer live the rest of his time in the flesh according to the lusts of men, but after the will of God. 1 Therefore, since Christ has suffered in the flesh, arm yourselves also with the same purpose, because he who has suffered in the flesh has ceased from sin, 2 so as to live the rest of the time in the flesh no longer for the lusts of men, but for the will of God. 3 For the time already past is sufficient for you to have carried out the desire of the Gentiles, having pursued a course of sensuality, lusts, drunkenness, carousing, drinking parties and abominable idolatries. "For whoever does the will of God, he is My brother and sister and mother." "For whoever does the will of My Father who is in heaven, he is My brother and sister and mother." not by way of eyeservice, as men-pleasers, but as slaves of Christ, doing the will of God from the heart.